Enter Coupon Code: "aprilpromo5" at check-out to save 5% and also receive FREE Shipping. 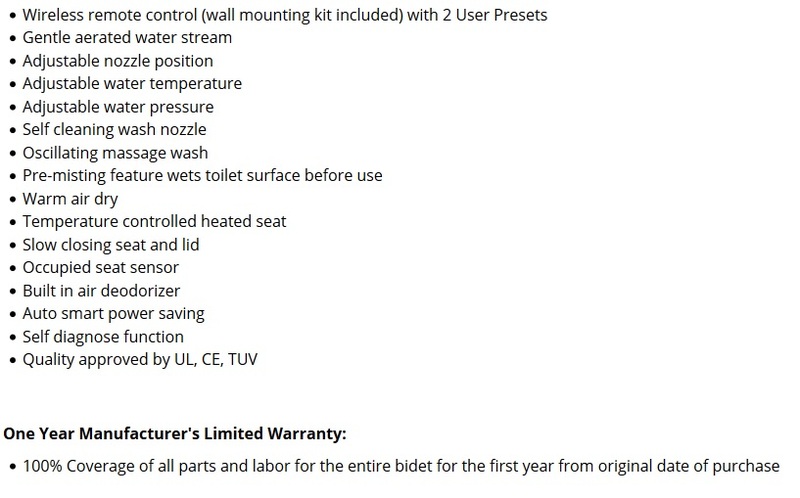 The TOTO C200 Washlet is the new mid-range bidet seat from TOTO that offers all the primary features you would want in an affordably priced model. The dual action spray nozzle provides both posterior and feminine wash function. The nozzle position can be adjusted forward or backward to suit your body, or you can have the nozzle move back and forth during the wash cycle to cover a broader wash area with the oscillating feature. Besides the positioning of the spray, you can also change the water temperature and the water pressure for an optimal wash. The C200 model uses a reservoir tank water heating system that warms the water internally. In addition to the warm water, the C200 also comes equipped with a heated seat and warm air dryer both with adjustable temperature settings. The washlet is operated with a wireless remote control with two user presets that comes with a wall mounting kit. The remote control is a very convenient upgrade over the attached control panel. 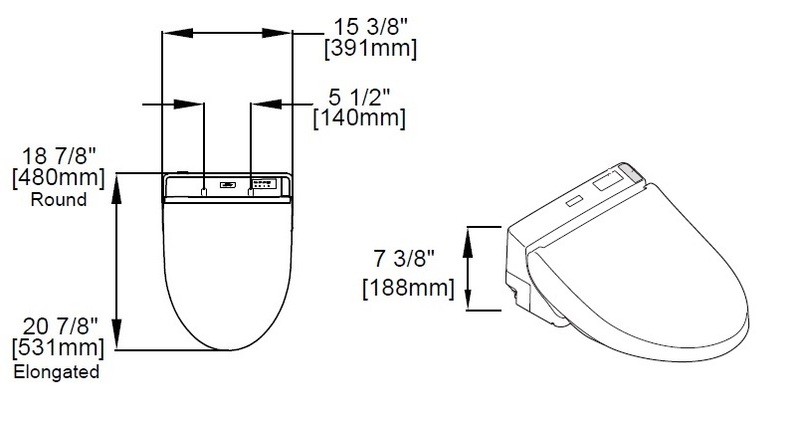 The wall mounting kit lets you place the remote in a location that is convenient and accessible, all while being much easier to see the operation buttons compared with attached panel units. Additional features you will find on the TOTO C200 include a built-in air deodorizer to help eliminate odor from the bowl, a self-rinsing nozzle that washes the wand every time it is used, and a premist function that sprays a mist of water inside the bowl to keep the toilet clean. There is also an energy saver mode plus a soft closing seat and lid. If you are looking for a great value from the TOTO brand, look no further than the C200 Washlet. Hi have been using my toto C200 for a couple of weeks. It works fine but wish the pressure was stronger for the rear clean and drying features. Also if run a long time the warm water seems to run out. We had a Toto Washlet in our old house and upgraded when we moved to our new apartment (which lacks a bathtub, making a bidet seat mandatory). It performs flawlessly so far and I greatly appreciate the automatic deodorizing fan function. All the water temperature and pressure settings work fine for me. Costs more, but the Toto is worth it. Seat is smaller than my older model, also water pressure, even at highest setting is too low. Also the remote control of older model was better. Unit was very easy to install. Easy to install and use. A little bit of heaven in the bathroom. Reminds me of my trip to Italy. Something on my bucket list has finally come true. This bidet is the greatest! I tried my first washlet while traveling in Asia. It took about 1-minute to fall in love with this addition to my bathroom activities. Upon my return to the states I installed my C200. The install was straight forward and only took about an hour. I would recommend this to anyone. For several years my son who has travelled a lot tried to talk me into installing bidets in our home. I finally installed one in the Master Bath. It is absolutely wonderful! I was surprised at how easy to use and how nice the various functions are. The TOTO C200 has everything I would ever want. 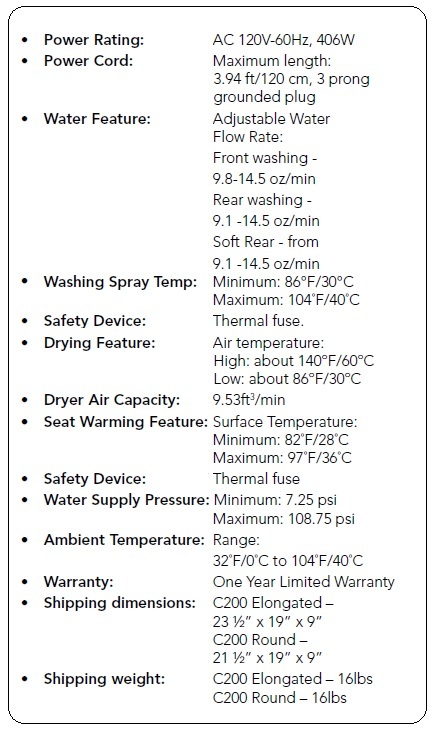 There is a seat warmer, temperature settings for seat and water temperature, water pressure for front and rear, pulsating and oscillating features, a soft setting and one with more pressure, a dryer with temperature setting, and a deodorizer. There is an energy saving option. With this bidet there are not only the obvious cleanliness advantages, but also now a savings in water and toilet tissue! Now I am wondering why I waited so long to make this purchase. Certainly a great choice and will not do without this necessity ever again!